The incredible third AMG GT Roadster variant sits between the current GT and GT C, with 0-100km/h taking only 3. 8 seconds! If you're looking for a powerful roadster, but one that is not as mental nor as pricy as the AMG GT-R, this is most certainly an option. 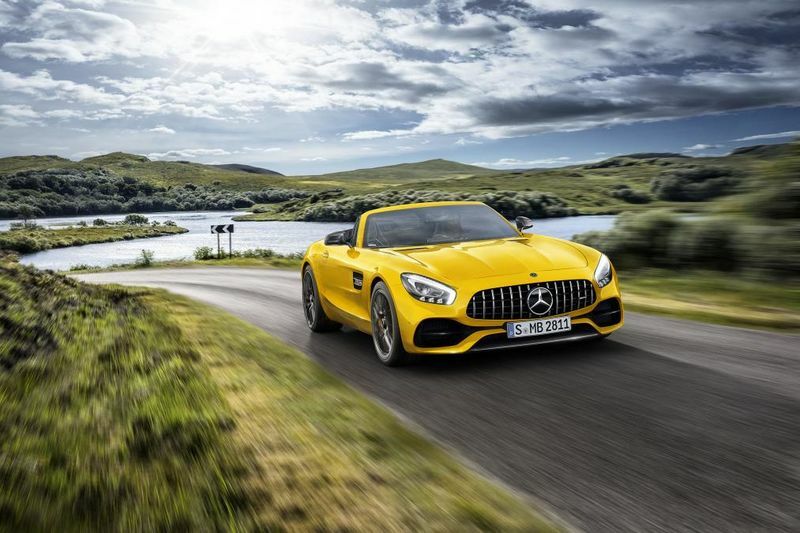 The new Mercedes-AMG GT S Roadster has been revealed. It’s the third variant to join Affalterbach’s drop-top sports car lineup, and it sits between the current GT and GT C in terms of performance and price. Under the bonnet sits the same ‘hot vee’ eight-cylinder twin-turbo used in the rest of the AMG GT range – and indeed almost every other current 63-monikered AMG. An output of 515bhp, or 384 Kilowatts, places the GT S between the standard 469hp GT and the GT C’s 549hp. The 670Nm peak torque also sits between the other two – 10Nm below the GT C but 40Nm above the GT. As a result, the GT S covers the 0-100km/h dash in 3.8 seconds en route to a top speed of 307km/h. Which by no means is slow! Similarly, the chassis spec sits between the two current Roadster incumbents. The GT S features an electrically-controlled limited slip differential and adaptive damping – neither of which are fitted to the standard GT Roadster – while the wheels measure 19 inches at the front and 20 inches at the rear. They house composite brake discs that measure 390mm at the front and 360mm at the back. Drivers who wish to focus the driving experience further can upgrade to the AMG Dynamic Plus package which offers a stiffer suspension, active engine and transmission mounts and a retuned steering setup aim to deliver a sharper drive, while inside the pack adds an Alcantara-effect steering wheel and yellow details in the dials. Four-wheel steering is also an option whereby the rear wheels turn in the opposite direction to the fronts at low speeds to aid manoeuvrability but turn in the same direction at higher speeds to boost overall stability. First deliveries of the GT S are said to be due in July this year and, although Mercedes is yet to confirm prices, the current AMG GT pricing structure suggests customers should expect to pay around R2,700,000 for this beast! Are you a Mercedes fan? Let us know what you think of the all-new 2018 Mercedes-AMG GT S Roadster in the comments.